PCI connects you and your organization to a world of resources that delivers results. Join PCI and put the power of your membership to work for you. PCI invites organizations to take advantage of information, education and representation dedicated to the support and growth of the entire powder coating industry through corporate membership. Members are promoted daily via their Membership Directory profiles on www.powdercoating.org which receives thousands of unique visitors each month. They are also invited to contribute articles and "white papers” as industry experts for print and online publication. Members also receive discounted rates on advertisements in the Powder Coated Tough magazine and its affiliated products. In addition, members have multiple opportunities for exposure by participating at PCI events at significantly reduced rates. Annual events include a technical conference, summits and a membership meeting. Every new member receives a copy of the latest edition of the Powder Coating Finisher’s Handbook, a 500+ page, comprehensive guide to the powder coating process. In a recent survey, our members voted this as one of our most important member benefits. In addition, members have access to discounted training through hands-on workshops, seminars, and webinars. Offerings include both introductory and advanced powder coating courses as well as customized field training. Members receive significant discounts on PCI publications including technical briefs, recommended procedures, troubleshooting guides, and more. Additionally, PCI is equipped to connect members to industry experts for technical and laboratory services. Members also remain informed on industry trends and market intelligence through e-newsletter subscriptions, publications and social media communications. PCI maintains strategic partnerships with other professional industry organizations and government entities to ensure that members stay well informed. 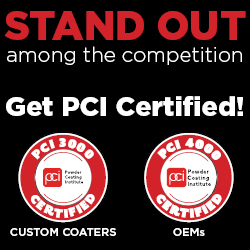 PCI has developed the PCI 3000 Certification program (for custom coaters) and the PCI 4000 Certification program (for original equipment manufacturers) to improve the quality of powder coating finishes available in the marketplace. Members can participate in the auditing and certification process at a significantly discounted rate.